i've just finished up pinspiration no. 3 - this fresh and fabulous bag. inspired by this pin (which i am ashamed to say i pinned 45 weeks ago - yes, it took me that long to do something about it). there is a free pattern and directions here (thank you, very purple person!). i just got out a newspaper and drew my own pattern (will make the handles slightly longer in the next go), but i used the directions. they're good if you're an experienced seamstress. 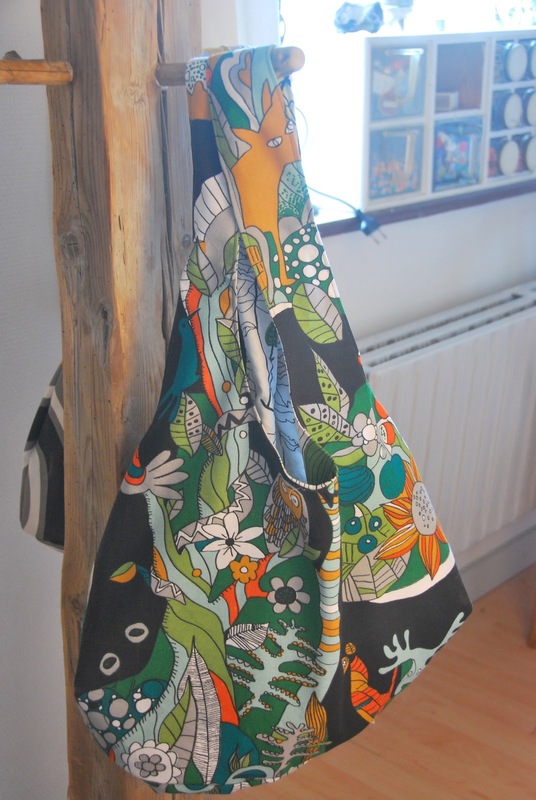 this is some fabric i bought ages ago, with pillows in mind, but i absolutely LOVE it as a bag. it's a rather heavy canvas - i suppose it's an upholstery fabric. it has some synthetic content (you'll see in a minute how i found that out). the directions are pretty good, but i'm not sure i would have thought that if i hadn't made all of those reversible dresses last autumn. the bag is theoretically reversible, tho' i put a pocket on the plain black lining inside and don't intend to reverse it. 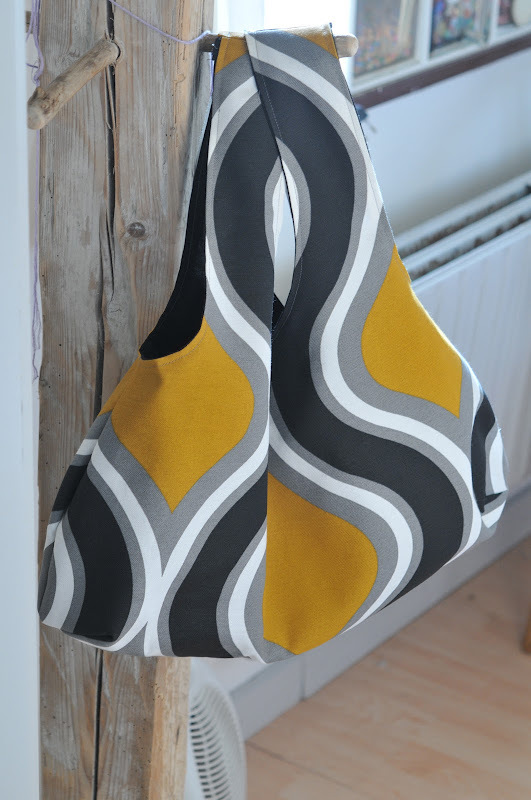 if you had two fabulous fabrics, you could definitely nake a reversible and versatile bag. here's where i'm using a brush to help me turn it - that moment is always a bit weird, as it feels like you must have done it wrong, but then it ends up all right. finishing the handles was easier than i thought and easier than my dresses were last autumn. it was here that i felt the directions were a bit iffy - i wished there were better photos of the process, but i muddled through and it did go together quite smoothly. the improvised pocket i put on the inside - i just NEED somewhere to put my phone so i'm not rummaging around for it in the midst of 50 old receipts and wads of used kleenex. my version of the bag is a bit wider than the one i pinned - it will make it nice and roomy for all kinds of things - i'm thinking knitting projects and cameras. i'm using a little room off my living room as a craft room these days - i moved the dining table there a few weeks ago. unfortunately, there's no working electricity out there, as when we moved the 1940s electrical box and got a new, modern one, they didn't reconnect that end of the house (it had been cobbled together originally and so the electrician didn't realize it wasn't reconnected). until i moved my crafty bits out there, it didn't really matter, as we didn't use that room except when we had couchsurfers. this morning, i lit some candles on the table and as you can see, kind of forgot about them when i was working on laying out the bag. soon, my fabric was flaming up rather merrily and stinking up the place - possibly indicating synthetic fibers. i managed to quickly put it out and only ruined a small corner of my fabulous fabric. 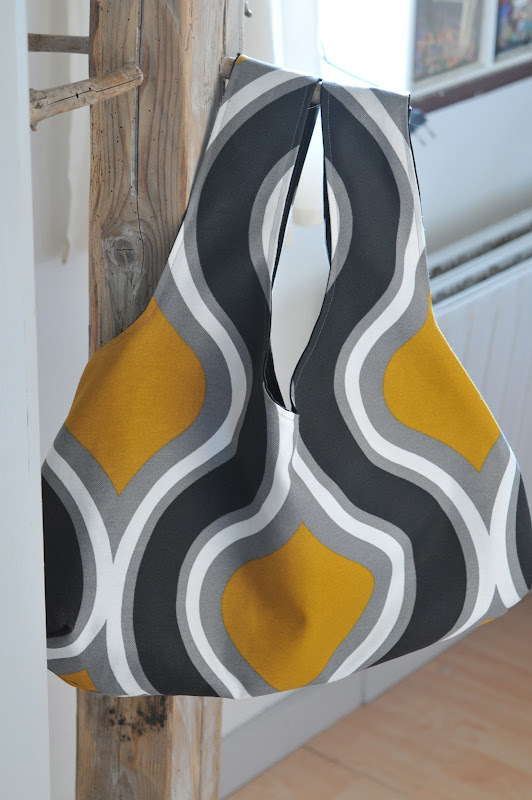 the first bag was so much fun, i'm going to make up another one with this fabulous fabric that i bought ages ago in oslo. you can never have too many bags. UPDATE: now with the second bag complete - and a bit longer handles so it fits over the shoulder a bit better. i'm so happy i finally used some of my fabric stash! i'll enjoy it so much more now than i did while it languished on the shelf. what a lovely bag! sewing bags is so much fun :-) well done on your pinspiration quest! You know I am going to ask--are you going to sell these bags???? Terrific fun! I have a few projects “to make” on pinterest and now you’ve got me feeling inspirational. so cute! yellow and grey rocks. great bags and the fabrics are such fun. a friend of mine makes similar bags and a little matching baglette for her phone. she then applies a woven tape or ribbon tie to the inside of the bag, a loop and a snap on the phone case...no more digging for the phone.